Back to this year's Beat the Bridge. I get super excited about this race because 1) it's for a cause that's dear to me, 2) it's sponsored by my beloved Nordstrom peeps and 3) it's on my college campus. 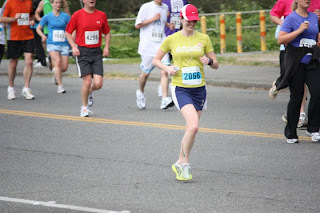 Going into this race this time around, I just wanted to beat the bridge (duh) and enjoy everything else. Mission complete. The first two miles (until the bridge) I gave it all I could (8:42 and 8:37 pace). After crossing the bridge (and trying not to get my awesome Lunars stuck in the metal grating), I walked a little to get my heart rate back down. I felt great! Perhaps I was imagining Goober "running" too. There were a couple of runner dad's with their infants in jogging strollers on the sidelines, probably cheering for Momma. I thought to myself..."that's Trav and little Goob next year!" 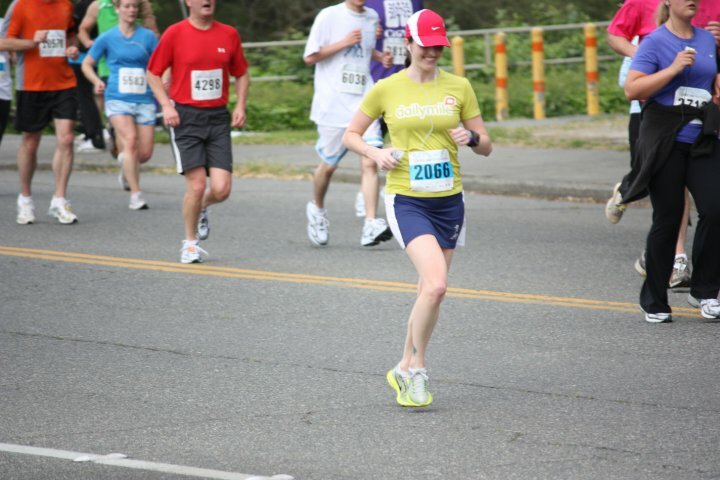 I picked up the pace a little more for the last mile, and I tried my best at my finish line kick. Crossed the line and saw Trav smiling at me. Yay! Side Note: Trav was an awesome race photographer for me, and I hope he knows that it means a lot when he attends my races! So there you have it! Goober's 4th race! :) Bring on the next! Having the goob cheer you on is awesome! my guy is 3 now and he can't wait to run his first race! Congrats Z and little G on a great race! Yay!! Way to go Zoe--and Goober! Awesome job Zoë!! 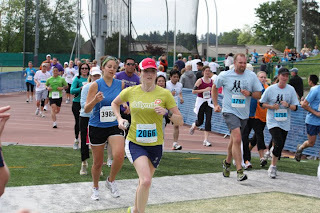 It's always a sweet thing to go back and conquer a race like that. You rock! Congrats Zoe & Goober! Support from the hubs is awesome. Fun recap! Great job beating the bridge!! How far is 8K exactly? I love how you start to notice the strollers and babies and stuff like that!! I think you should go back for your masters! I started mine when Levi was 9 months! It was perfect because I was able to stay home with him for a while, study while he played around then study at night until after his second middle of the night feeding frenzy! You can do it!!! I love that you thought about Goober in the stroller next year...too cute!! Trav will have the tough job then. Oh a GOAL Masters!! Love it! Way to go, both you and Goober. Nice pictures too, the weather must have been perfect for it. Great job beating that bridge! Just out of curiosity, how long do you have to cross it before they put it up? Congrats! All those pictures are awesome and one day you will get to show little Goober that he/she beat the bridge with you! So fun! yeahhh Zoe! great Job...and good job to little Goober for being nice and letting you feel well! Congrats! I'm glad that you enjoyed the race. You look so cute out there!!! Way to rock it girl! Nice stats, especially for a mommy to be!! congrats on a strong race, love the pics! Great job on the race. Your time is great!! 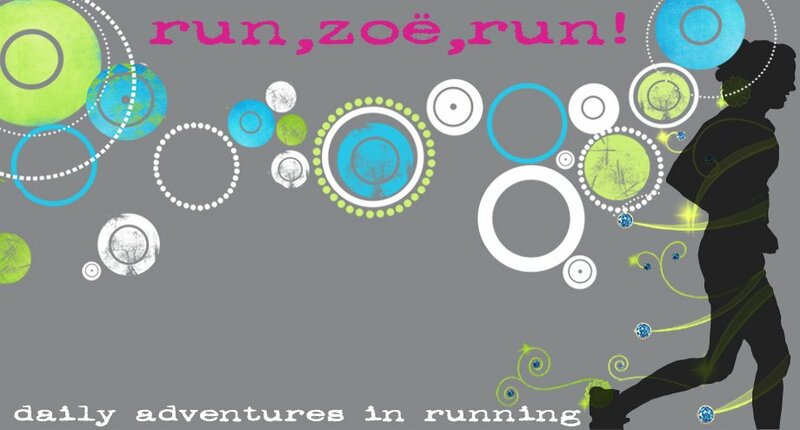 Way To get even with the course Zoe! Also way to chick the dude. Can you belive that? Turning around *in front of the cone*? I would have tripped him. 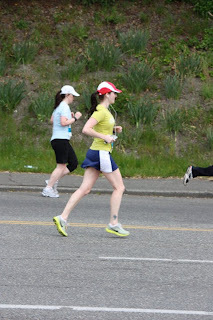 Great race - and pics!